Dhundiraj Govind Phalke (left), known as the father of Indian cinema, examines a filmstrip. The film Raja Harischandra features an all-male cast, some of whom played female roles. Film festivals around the world are celebrating the 100th anniversary of Indian films this year. But Indian filmmaking began with a quieter start. 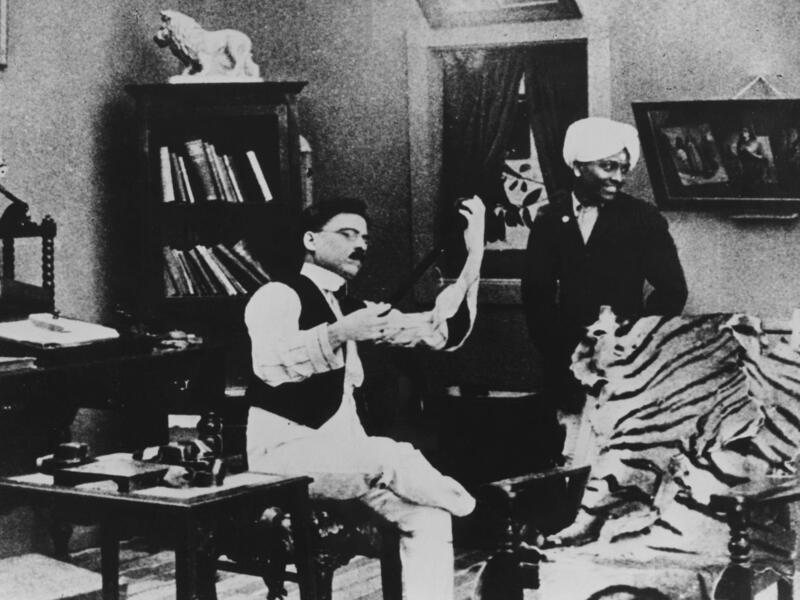 Some film historians say Bollywood can trace its roots to Raja Harischandra, a silent film that was first released 100 years ago Friday. The black-and-white, 40-minute-long film tells the tale of an ancient king of India who loses his kingdom and family as a test of character by the gods. The film's creator Dhundiraj Govind Phalke, also known as the father of Indian cinema, knew the story was a popular legend in India. He also saw it as perfect source material for a movie. Still, when Phalke set out to make his first film a century ago, he was taking on more than creative challenges, according to Indian film scholar S.V. Srinivas. "The cinema is not an Indian form to begin with. It's not an Indian technology to begin with. The challenge [for Phalke was] to make it Indian," Srinivas says. Phalke raised Indian financing and hired Indian actors to tell an Indian story on screen. According to Srinivas, it was partly an act of Indian nationalism. Unlike most film audiences today, early moviegoers in India were not disappointed to see familiar tales in films like Raja Harischandra, says Nasreen Kabir, a documentary filmmaker who's written books about Hindi films. "They didn't go to the cinema to be surprised, so formula works, very much so," she explains, "Even today, in Indian cinema, if you looked and studied it well, it depends a lot on repetition and formula." Today's Indian film industry has sometimes been criticized for churning out "Bollycats," unauthorized remakes that copycat Hollywood movies and other foreign films. But Srinivas says mainstream filmmakers in India are following a tradition that began with Phalke. "Look at it a little differently from, say, a copyright lawyer's perspective," he says, "If the challenge really is not to create a wholly original story but to indigenize it by adding, subtracting, [or] transforming your material, then you have another history of Indian cinema emerging." 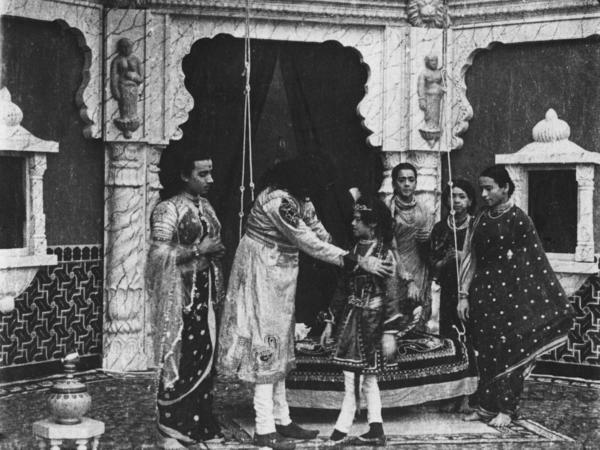 Phalke's film also features scenes of grand palaces, elaborate costumes, and dancing courtesans that seem to appear out of thin air — early glimpses of Bollywood-style storytelling that's now world-renowned. "Today's Bollywood spectacles are definitely the children and grandchildren of what Phalke was doing," Vick says. It's just become bigger, louder and more spectacular, he adds, as technology and people's skills evolved — and as India's become one of the major players in the global film industry. BLOCK: ...like this one from the 1998 film "Dil Se," a troupe of dancers gyrates in unison to a love song on top of a moving train. BLOCK: Indian filmmaking began more quietly. As we hear from Hansi Lo Wang of NPRs Code Switch team, some film historians say Bollywood can trace its roots to a silent film that was first released 100 years ago today. S.V. SRINIVAS: You'd probably hear the tabla. You'd probably hear a string instrument. You'd probably hear a harmonium. WANG: The National Film Archive of India commissioned this musical soundtrack for the film's DVD release. WANG: Back in 1913, though, no two screenings of "Raja Harischandra" would've sounded the same. Srinivas says some screenings may have been rather quiet. SRINIVAS: Except for the narrator whose job was to read inner titles. WANG: Read the inner titles in English or a local language like Hindi. WANG: The narrator would guide you through the tale of Raja Harischandra, an ancient king of India who suffers a lot. SRINIVAS: He gives away his kingdom and then he loses his wife and his son dies. You know, this is a story of a man being tested. WANG: The film's creator Dhundiraj Govind Phalke knew the story was a popular legend in India, perfect source material for a movie, he thought. But when Phalke set out to make his first movie a century ago, he was taking on more than creative challenges. SRINIVAS: The cinema is not an Indian form to begin with. It's not an Indian technology to begin with. The challenge is to make it Indian. WANG: So, Phalke raised Indian financing and hired Indian actors to tell an Indian story on screen. And audiences back then were not disappointed to see a familiar tale, says Nasreen Kabir, who's written books about Hindi films. NASREEN KABIR: They didn't go to the cinema to be surprised, so formula works very much so. And even today, in Indian cinema, if you looked and studied it well, it depends a lot on repetition and formula. WANG: Today's Indian film industry has sometimes been criticized for churning out Bollycats - unauthorized remakes that copycat Hollywood movies and other foreign films. But S.V. Srinivas says mainstream filmmakers in India are following a tradition that began with Phalke. SRINIVAS: Look at it a little differently from, say, a copyright lawyer's perspective. And say that, if the challenge really is not to create a wholly original story but to indiginize(ph) it by adding, subtracting, by transforming your material, then you have another history of Indian cinema emerging. WANG: There is one other tradition of Indian cinema that emerged from Phalke's first feature film, says Tom Vick, a film curator at the Smithsonian's Asian Art museums. TOM VICK: It actually has the very first wet sari scene ever in Indian cinema, which is a tradition that exists still today. Even though he couldn't get women to perform on film, there are men dressed as women and there's a whole scene where they are bathing in their saris in this kind of fountain. WANG: There are also scenes of grand palaces, elaborate costumes, and dancing courtesans that seem to appear out of thin air in Phalke's film. Vick says they're early glimpses of Bollywood-style storytelling that's now world-renowned. VICK: It's just become bigger and louder and more spectacular as technology and people's skills evolved. WANG: And as India's become one of the major players in the global film industry. Hansi Lo Wang, NPR News. Transcript provided by NPR, Copyright NPR.